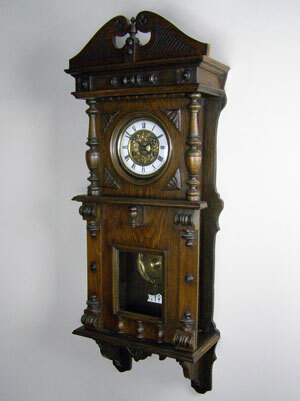 This is an Art Nouveau spring-driven wall clock in an oak case. The enamel dial has Roman numerals and an embossed dial centre. The brass pendulum is also embossed with flowers and is visible through a glazed aperture. The case is decorated with turned half columns and carvings and the gong striking movement is of eight-day duration.